Microneedling is a dermatologic procedure that creates a controlled skin injury in order to rejuvenate skin. Also known as Collagen Induction Therapy (CIT), it is a treatment where fine surgical needles are used to penetrate the skin leaving behind tiny puncture wounds that stimulate collagen production. The upshot of this micro injury is that it helps to fill in fine lines, plump the skin, and to create a younger, refreshed look. 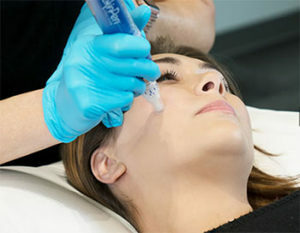 I perform microneedling using SkinPen Precision for patients who would like to reduce the signs of aging. Additionally, it’s a great treatment for improving conditions like acne scarring, for reducing fine lines and wrinkles, tightening loose skin, plus improving skin texture and pore size. Most patients can have microneedling as long they don’t have any active infections, lesions, or wound healing problems. We start by applying numbing cream to your skin, so you’ll have a comfortable treatment. If you’ve opted for microneedling with PRP, our technician draws your blood and then runs it through a centrifuge to isolate the platelets. Your platelet-rich plasma is used during the microneedling process to enhance your results. The entire process typically takes about one hour. Either way — with or without PRP—you can expect slight redness similar to a sunburn immediately after your microneedling treatment, which usually subsides within several hours to a few days. The ultimate results gradually become apparent. While home devices for microneedling are available, I strongly advise against using them. Since the way microneedling works is by causing micro channels, you would be risking infection and/or scarring. This is an effective procedure when done properly and has many pitfalls when not. Leave it to experts. We’ve had special training, and I routinely perform this in my medical office with a medical grade needling device. This is not a one-time and done treatment. Depending on your skin condition and goals, you’ll need several treatments to obtain optimum results. Speak with us about setting up an effective microneedling schedule. Please feel free to contact us to make your appointment. Please note: There is a $100 consultation fee for those new to microneedling, which can be applied to your treatment if scheduled.